The Heritage Le Telfair is a top class resort with some of the largest standard rooms I’ve stayed in! Beautifully renovated, this elegant and colonial-style resort has a beautiful beach-front setting and a real focus on wellbeing. Crossed by a tranquil river and fronted by a white-sand beach and vibrant lagoon the natural setting couldn’t be any better. At the heart of Domaine de Bel Ombre on the south coast. 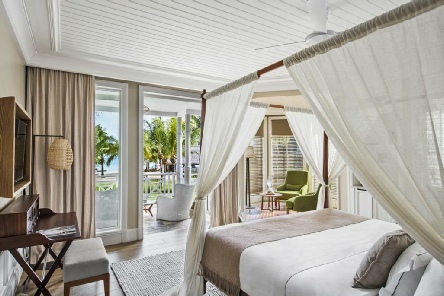 The wonderfully refurbished butler-serviced suites are located in two-storey villas dotted around the resort and have a beautifully light, plantation house style with white-washed walls and dark wood furniture. The Gardenview Suites overlook the resort’s tropical gardens while guests in the Seaview Suites and Beachfront Suites can enjoy views of the Indian Ocean from their balcony. It’s well worth upgrading to the Junior or Senior Suites for a little extra room as they feature a living area or room respectively. Facilities include a Spa, fitness centre, kids’ club and 2 swimming pools. Dining at Le Telfair is a pleasure and there are three restaurants and a lounge onsite. Attached to the Heritage Le Telfair Golf & Wellness Resort, the award-winning 18-hole Heritage Golf Club covers 100 hectares and is situated between the mountains and the sea in an undulating landscape interspersed with lakes, streams and trees. 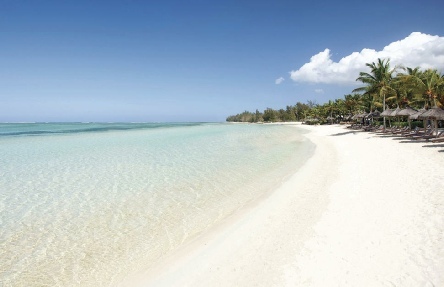 2019 package holidays to the Heritage Le Telfair Golf & Spa Resort Mauritius Prices are per person based on two sharing.